Reminds me a little bit of the X-33. I saw the post earlier about your book; you got me beat. I have a signed copy of Sled Driver that I will part with only when I am in the grave... maybe. _Sled_driver_ sits on my bookshelf next to a copy of 'The Right Stuff signed by 10 of the men who landed on the moon (I've missed Irwin and Scott). come to think of it, I should probably will those books to the local college or library so that they don't fade into dust when I am gone. 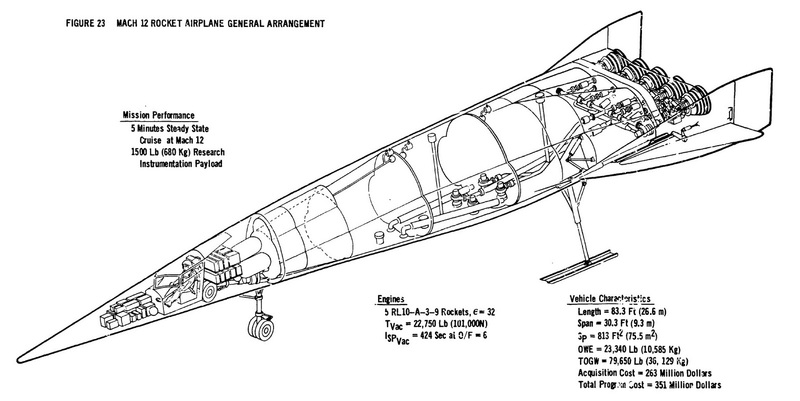 They built the SR-71 without CNC, without CAD programs, without calculators (slide rules, my god does anyone else on this site know what those are? ), without 3D printing, and custom made wind tunnels that were considered National Secrets in the same line as nuclear weapons data. This, to me at least, is what makes the plane a legend. I dunno. A copy of Right Stuff signed by 10 astronauts is, well, pretty well beyond reproach. If this were a competition you'd have totally won it right there! The Venn diagram of "Planes that are awesome" and "Planes that were designed by Kelly Johnson" looks almost like a circle, I reckon. Sepulveda Blvd down by the airport has a long line of "Hollywood tiles" of aviation pioneers; Kelly Johnson's is by Bed, Bath and Beyond. When I move outta here I'm making a rubbing of it. If you haven't read Skunk Works you're missing out. I have a copy of Skunk Works somewhere in the piles and piles of books over here. I'm still kicking myself all these years later for missing Irwin in '89 for the 20'th anniversary. A few of the astronauts were giving a talk about 100 miles from me, and I said "I'll wait for them to come to town and get a signature then." Moral of the story there is "He who hesitates loses." I think of Kelly Johnson as the Isaac Newton of aerospace. Both were in tune with the universe in ways that I am not able to describe. About the only aircraft designer outside of that circle is Burt Rutan. Did you know that Spaceship One was the first aircraft not funded by a government to break the sound barrier? Friend's husband's summer job was cleaning up at Scaled as a kid. His aunt was the bookkeeper for 20 years. The idea that SS1 wasn't funded by the government is a bit of a misnomer... Scaled gets 80% of its funding from Black AF coffers. Does this art look familiar? I wish I could make that in Kerbal Space Program. This thread had me searching online for all the weird aircraft ideas people came up with in the 60's and 70's. My favorite new airframe is The Breadbox as it is a complete "WTF why not?" solution to a problem. And I can imagine sweeping the floors at Scaled was amazing. Beats running the beer and soda cooler for a crappy grocery store for sure. Paul Allen paid to build SpaceShipOne which is where this claim comes from. The point being made is that this is the first time a plane broke the sound barrier after being build not for a government contract. Yea, they got fed money, all these companies do/did. I guess if we want to be technically correct, then even Thrust SSC was not privately funded as they used RAF F4 engines that they "borrowed" for the car. Something tells me that you know all of this and we could go on for a bit about airframes for hours. Dude. Do I have the site for you. I understand the point being made and it's a genuine one. I'm a big booster of SpaceX et.al and an avid spectator of it all. A lot of the time I just throw a partial non sequitor out there to prompt better discussion. I should really start playing Kerbal Space Program. Problem being, I'm a casual console guy with a 92" projection screen and I haven't hooked a PC up to it.